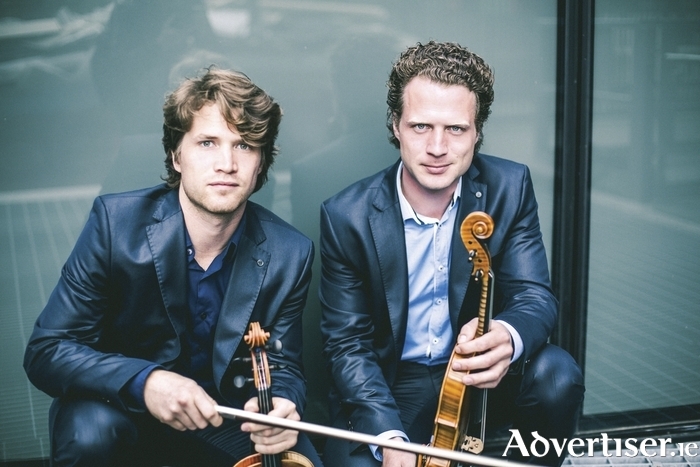 VLADIMIR & ANTON, the Slovakian violin virtuosos, who have been touring Britain with Katherine Jenkins, played the BBC Proms In The Park in Belfast, and released a new album this month, come to Galway in October. Vladimir and Anton Jablokov play the Black Box Theatre on Saturday October 8 at 8pm as part of their current Irish tour. The brother's album, Vladimir & Anton Live, was recorded over three sold-out nights at the Wexford Arts Centre this year, and is released on Rubyworks. The album draws on popular Russian classical music - including pieces by Prokofiev, Rimsky-Korsakov, and Shostakovich - as well as Russian folk tunes, with Vladimir and Anton being inspired by the adventures of their paternal Grandfather Nikolaj who was born in Moscow in 1925. Resident in Ireland for more than 10 years, Vladimir has established himself as one of the brightest stars on the Irish classical scene. Younger brother Anton has completed his Masters degree at the acclaimed Conservatorio della Svizzera Italiana in Lugano.